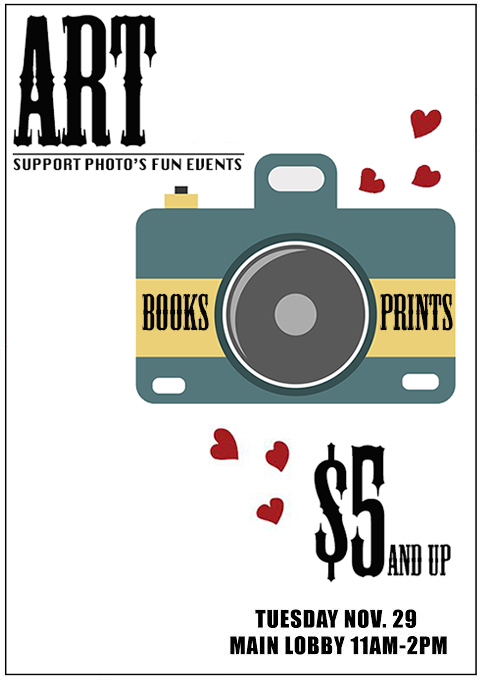 Come out and support the Photography, Printmaking & Publications students by purchasing art, books, and a delicious grilled cheese! We will be in the main OCAD U lobby of 100 McCaul Street from 11am-4pm. SUBMIT TO THE PHOTO SALE! November 25, 2016 / Jennifer Long / Comments Off on SUBMIT TO THE PHOTO SALE! WHO CAN SUBMIT: Everyone! Photo majors, Photo minors, Technicians, faculty, alumni… This 1-day sale is being done alongside Printmaking who has very generously offered to share their space with us! 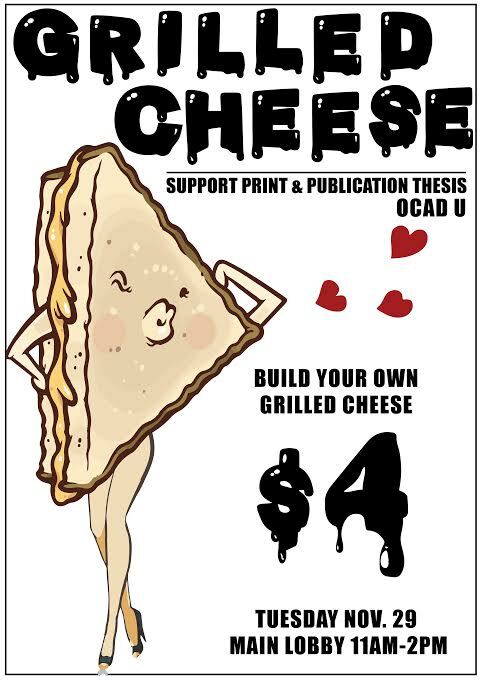 Printmaking will be selling grilled cheese next to us – forget your lunch on Tuesday and enjoy one of their sandwiches! – Find prints/zines/multiples… you want to sell! – Put your print(s) in a clear bag (ideally with a hard paper/board backing). Supplies available at Aboveground. Note: Jenn Long will deliver some free bags to the Photo Cage on Thursday. Drop your work off quickly to get free packing supplies! Other work can be loose. – Ensure that your name is clearly indicated on each work you bring. (Consider slipping a business card inside). This is important because this is how we will know who to pay! – We are also collecting books for the sales table – all books will be sold with 100% going to the fundraiser! MONEY: A Portion of each sale will be donated to the party fund to buy food and drinks. If we can raise $400 ($25 liquor license, $100 in alcohol & $275 for security guards fees) we can serve alcohol! If we don’t hit this amount, all funds will go towards food and non-alcoholic beverages. Participants will be paid and have their work returned within a week of the sale. Please note, we can’t be responsible for damaged or stolen prints. we are happy to take it! WE ARE LOOKING FOR VOLUNTEERS! If you can volunteer some time to sit the sales table on Nov 29th between 11-4, please reach out to Jenn Long – jlong@faculty.ocadu.ca. Additional volunteer opportunities such as social media promo, sale prep and post-sale payout is also needed! WHEN IS THIS PARTY? The party will be happening close to the last week of school or early in the Winter semester. Reach out to Jenn Long if you want to help plan our celebration! QUESTIONS: Ask Associate Chair Jenn Long – jlong@faculty.ocadu.ca! Jenn will be doing her regular office hours on Monday, Nov 28th 10:00-11:00 rm 480 and from 11:00-12:30 at the Photo Cage area! Come for a visit and cookie (supplies are limited here as well)! A workshop designed to introduce participants to artist residencies, application procedures and tips, strategies for securing funding and helpful resources when considering national/international residencies. 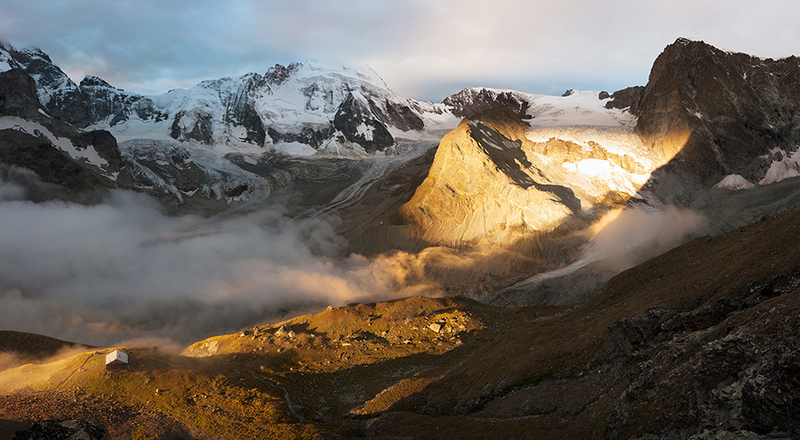 Residencies are a fantastic opportunity to challenge an artist’s practice in a manner that is both stimulating and focused in a unique environment. It allows one travel, to meet artists, curators and other cultural practitioners, and time to research, experiment and reflect upon one’s artistic practice. This three-hour workshop led by artist and educator Elise Rasmussen will provide participants with an overview of various types of artist residencies available, resources of where to look for residencies, and considerations in finding a residency appropriate for one’s needs. The group will be given tools for putting together a strong application as well as avenues to explore when trying to secure funding. Participants are encouraged to bring past/current applications and/or a work sample of 10-15 images and an artist statement to share with the group and receive personalized feedback. This workshop is designed to guide and outline the basic requirements of Graduate Schools in Fine Arts/Visual Arts in various Canadian post-secondary institutions. As one of the key components in the grad application is your visual support material, the workshop will focus on how to compile visual documentation in order to prepare comprehensive and focused visual representation of participants’ art practices. In addition, instructor June Pak will discuss some of the necessary elements in writing a concise letter of intent. This workshop will be a great opportunity for participants to share information on different graduate schools. Prior to attending the workshop, participants should make sure to do some research on the schools that they are interested in, such as articulating what they are looking for in a graduate program, and why they are interested in that particular program. – Participants are encouraged to bring a draft copy of their letter of intent (this could be in point form as well). Photographer Scott Conarroe will be giving a one hour talk to the Photography Thesis class (room 415, 100 McCaul) on Friday November the 25th at 10 am. All visitors are welcome! Please RRSP April Hickox at aprilhickox@gmail.com to ensure an extra seat is found for you! Final days of the Pop-Up Shop! November 11, 2016 / Jennifer Long / Comments Off on Final days of the Pop-Up Shop! As part of the Yorkville Village Arts Festival, OCAD U will be celebrating the stunning creativity of its students, faculty and alumni through a retail Pop Up Shop at Yorkville Village until November 12, 2016. The OCAD U community is diverse and inventive, playing an active roll in change-making design and art production, both locally and around the world. The OCAD U Pop Up shop will showcase a small selection of this creative force. With art and objects from more than 50 artists and designers, this shop will offer a multitude of reasons to support local artisans. Come to the store to buy the popular Tkaronto vs. Akwe:kon t-shirts (Mohawk language for “Toronto vs. Everybody”) designed by Kaia’tanoron Bush for the Indigenous Visual Culture at OCAD University. Also on display, a diversity of pieces including finely crafted jewellery, hand-made books, limited edition scarves, stickers, toques, ceramics, bow-ties, prints, paintings, photography, quilts and more. Ninety per cent of the sales proceeds will be given to the creators and ten per cent will be donated back to OCAD U to support the administration of this exciting initiative. A small selection of the amazing selection of works at the Pop-Up Shop. OCAD U Photo major Morgan Sears Williams is member of RUDE, an exiting collective that is making change and making space! RUDE’s first event is on November 25th at Geary Lane, and 40% of profits will be going to YMCA Sprott House, a homeless shelter for queer youth. Visit RUDE on facebook @TheRudeCollective to see the amazing RUDE featured artists including Kent Monkman and OCAD U Photo graduate Maddie Alexander! 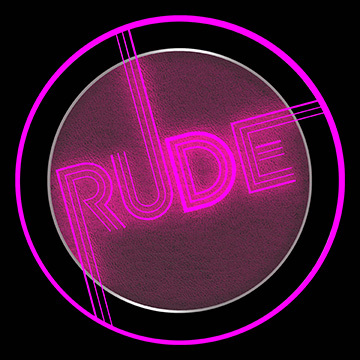 “Rude is an acronym for Real Unapologetic Diverse Expression. We are a collective of individuals whose main objective is to create positive spaces for queer folks, especially queer people of colour. This space manifests into a queer dance and art party, held seasonally by the RUDE collective. Our mission is to create a space that allows queer individuals, especially those that are marginalized due to racism, transphobia, gender identity and gender expression to interact and share in a queer positive environment. To showcase multiple art forms of marginalized queer cultural expression through supporting young drag queens, queer artists, queer DJs, and performers. To bring awareness to LGBTQ homeless youth and to contribute to organisations dedicated to eradicating it. Queer art is a vital part of RUDE events, as we recognize art to be the force that creates and changes culture and pushes political and social movements. The artists that we feature are RUDE because they are unapologetic about their queerness, their blackness, their indigeneity, their sexuality or gender. The artists chosen for our first event on November 25th, speak to the, often violent or oppressive, gaze inflicted on queer folks and subvert it in vulnerable, confrontational, and sometimes comedic ways. 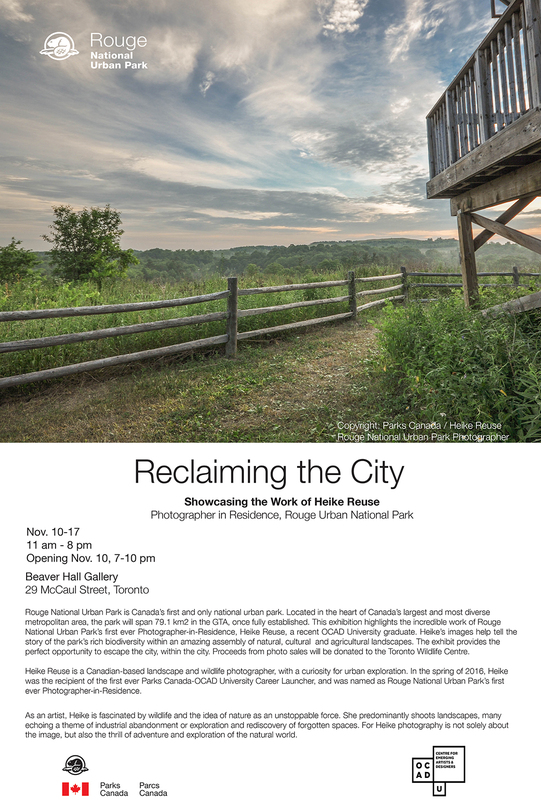 Congratulations to 2016 Photo alumni Heike Reuse on her upcoming exhibition at Beaver Hall! This exhibition celebrates the stunning photography Heike has done as part of the Emerging Centre of Artists & Designers Career Launcher program.